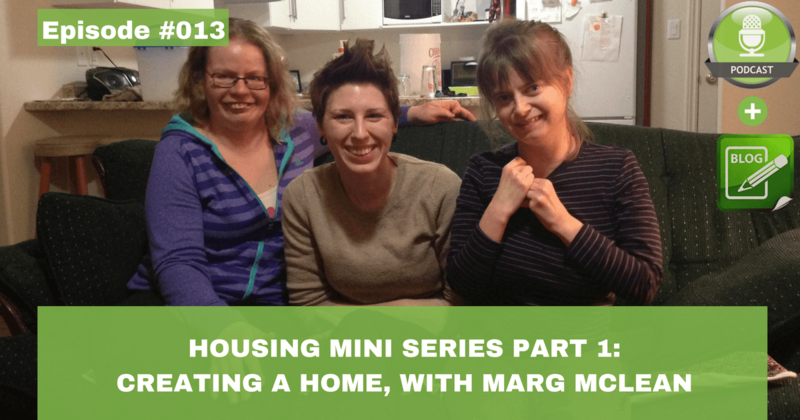 This is Part 1 of a 6 part mini-series on housing for people with disabilities. We are exploring the housing issue for people with disabilities, new innovative ideas, and success stories from around the globe. Subscribe to the mailing list to get all 6 episodes sent directly to your inbox! This week’s guest on the Empowering Ability Podcast is Marg McLean, Executive Director of Community Living St. Marys. Marg and the Community Living St. Marys team have been helping people with a disability create their home, and support solutions since the 1980’s when people were leaving institutions. This is a massive line to wait in as supply of residential homes is increasing at a much slower pace than the demand for people with a developmental disability in need of housing. So, should families be planning their own housing solution? Marg shares that people are going on the waitlist without thinking, talking, and planning what an ideal home looks like for them. (Note: This is exactly what my family did at the start of our housing search for my sister.) What works well is for families to come up with a vision of what would be a good home in community. I’ve created a FREE workbook to help you create your vision of the best housing solution for you and to take the first steps toward implementing this solution. Click Here to download the free workbook. Marg shares the stories of Michael, Bill, Gord, and Kayleigh on the podcast. Below is a short overview of the home they have created, listen to the podcast and watch the Community Living St. Marys videos to hear their full stories. Michael’s story – In his mid 20’s Michael lived in a rural area with his family, and was looking for opportunity to move out of his family home. Michael’s family bought a duplex in a small city, where Michael attended school and has access to transportation. Michael and his housemate live in the upper level and his supportive neighbours, Leah and her mom, live in the main level unit. The duplex is paying the mortgage, and when the mortgage is paid off it will enhance his Registered Disability Savings Plan (RDSP). Note: Housing trusts can be explored if you are considering home ownership. Bill’s story – Bill had a supportive housemate living with him, and when his supportive housemate purchased their own home Bill moved with them. Sharing a home with an individual or a family is commonplace, but can be forgotten when considering housing options. Gord’s story – Gord wasn’t interested in a staff model so he found a couple that live on a farm to live with, and they welcomed him in with open arms. This couple and Gord have shared their lives together for the last 19 years. Kayleigh’s story – Kayleigh moved out of her mom’s home and into her own apartment in an 8-plex building as part of Community Living St. Marys’ ‘Supportive Neighbour’ project with The Ontario Developmental Services Housing Taskforce . A young family lives beside Kayleigh and provides some supports. Kayleigh also ended up inviting Yvonne to live with her as a roommate. * Note: The Ontario Developmental Services Housing Taskforce operates at arm’s length from the Ontario government who provided $3MM to fund new innovative housing projects over a 2-year period. In year 1, 12 projects were funded by the Housing Taskforce. Eric’s Story – I live with a roommate in his own home, and he has outside support come to the house. We are roommates who provide each other friendship and I help with things like lunch, letting his dog out, and being there overnight. Check out the podcast to hear some creative ways you can find people to share home with, and to hear the Lesson’s Marg has learned helping people with disabilities to create their home. A key takeaway for me from the conversation with Marg, and the research that I have done on housing is that families need to start thinking and acting on their own vision for housing. What does the ideal home look like? What does the ideal community look like? Take control of your own future. Click Here to download the free housing workbook to get started on your solution. I thank Marg for coming on the podcast and sharing her experience and stories on housing for people with a disability. The Empowering Ability Podcast is available on iTunes and various other apps so that you can listen while on the go from your smartphone! © 2019 · Empowering Ability All Rights Reserved.